Latest Update: 6 December 2002 - The Home and Tunisia pages have been updated; the Top Ten Page has been created to give you our views on what was and was not useful on our trip. This site documents our journey from Pretoria (South Africa) home to the UK. We set out for Cape Town at the end of March 2002, but sadly endured an unscheduled stop there - for details of the accident, see button on left hand side (Setbacks Page). From Cape Town we continued our journey north on Saturday 8 June. We travelled through southern and East Africa, before heading west through Sudan and Chad prior to crossing the Sahara via Niger and Algeria. We arrived in the UK, after a ferry crossing from Tunis to France, on 22 November 2002 having completed 35,248 km. You can navigate your way around the site using the buttons on the left, or the links within the text. For example further details of the preparation of the second vehicle, Daphne II press (see Vehicle II Page). The countries page details our experiences and thoughts on each country. Individual countries can be opened either from the side button or from the name of the country on the map. The route page indicates the planned (in green) and actual (in orange) route taken. Rather than list all our equipment, the Top Ten Page gives our thoughts on what worked and what did not. This is the story of a journey. It all started a couple of years ago on a trip to Tanzania, when Adrian mentioned in passing that he had an ambition to drive from the UK to Cape Town. We both thought for a while, agreed that this would be a wonderful adventure, and carried on with our respective jobs. Later, whilst Adrian was working in Pretoria, we realised we might never have this opportunity again. We decided to take a career break to make the trip. So that was the beginning. 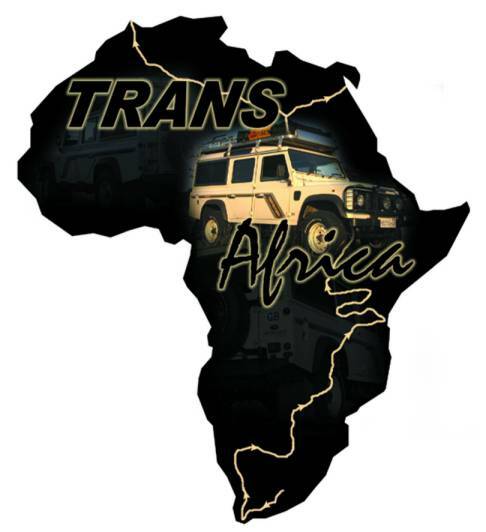 Since then, we bought a Land Rover Defender (Daphne) in October 2001 in Pretoria, modified her (see Vehicle Page) and we conducted a trial run through the Central Kalahari Game Reserve in Botswana over Christmas and New Year 2001/2. After further modifications, we set out at the end of March 2002. Both being keen amateur photographers we tried to maintain a pictorial record of our travels. The digital camera should provide pictures to the website to give a flavour of each country. This web site has been set up to enable you to follow the preparation and planning, and then monitor our progress by viewing each country page. You will be able to find further detailed information in each of the other sections (see buttons on left hand side). Individual countries can be accessed by pressing the "Countries" button which will take you to a page with a button for each country we plan to visit. On the individual country pages you will find our diary entries. As we are starting in South Africa, many of the pages will not contain any information until later in our trip. If you would like to contact us, the email address is at the bottom of this page. Any advice or comments would be very welcome. The site has been set up very simply, using HTML rather than an internet website package, as we wanted to avoid animation and other effects which take a great deal of time to load. We also wanted to ensure compatibility with as many browsers as possible, and did not want to be sending a great many complicated coding sequences down a phone line when we provide the updates. Now we are home we welcome other's thoughts or questions about the travel or queries about your own travel.